I've been talking for the past few weeks about how proud I am of my wild blackberries, how I have great plans to protect them and hug them and love them and call them George. But something has been gnawing at my subconscious, and yesterday it dawned on me. 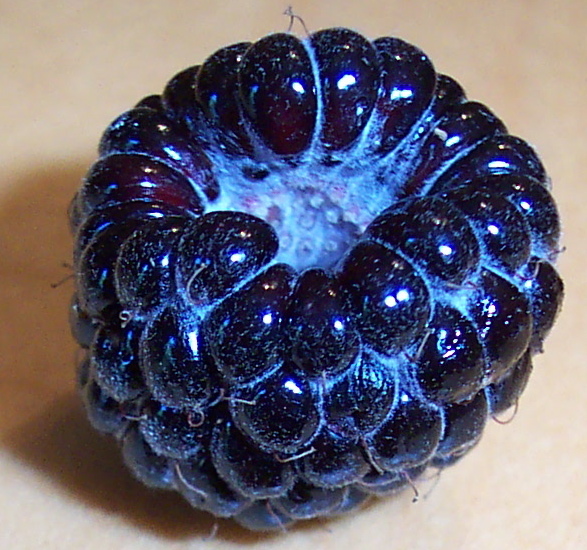 Blackberries are supposed to have their cores intact. Are these really blackberries? Maybe they're not. Maybe they are black raspberries. The realization came while picking them. Take a look at the photo to the right (click to enlarge it). Note in the cluster in the center where you can still see the 'stub' from the center of the berry, still on the branch. This is in large part how we classify raspberries versus blackberries: with blackberries, that stub (usually) stays in the berry; in raspberries it stays on the plant. This is why blackberries are cheaper -- that stub lends them structural integrity and makes them easier to transport without getting crushed. Discussions with friends and neighbors ensued. Everyone told me I was mistaken -- "I've been eating those since I was a kid. They're clearly blackberries. 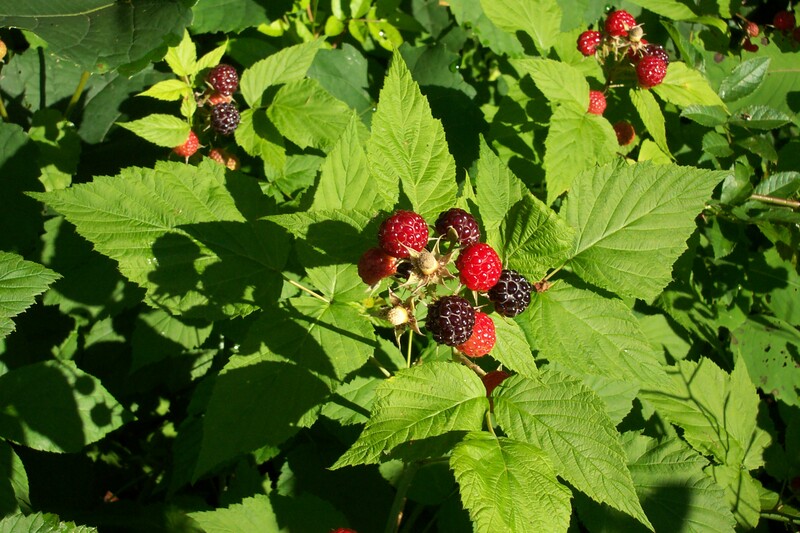 Black raspberries are something completely different." I think, however, that it is these folks who are mistaken. These are black raspberries. Here is a closeup of one of the berries from these brambles. Note the core is completely gone, and the druplet's distinctive raspberry shape, and especially note the hairy nature of the berry -- that's more of a raspberry characteristic. The most common variety of raspberry around these parts, in fact, goes by the name "Rubus Pensylvanicus," vulgarly referred to as the "Pennsylvania blackberry" (which explains why my neighbors call them "blackberries" -- that's their name, even though they're not the same as the blackberries you get in the store). Making the matter more complex is the fact that all members of the rubus family vigorously interbreed, making a specific identification difficult. The other aspect that makes me lean towards the black raspberry identification is the growth pattern of the stem -- the primocanes get very long, and then arc towards the ground, which is not how (I'm told) trailing blackberries grow. In fact, where the tip of the primocane hits the ground, it roots -- this is not an easily trellissed plant. Are there any budding botanists out there that can suggest ways I can identify the actual variety I've got here with confidence? You might see if there's an available dichotomous key for PA fruits; I know there are some available for fruits in other areas of the country. The Hunt Institute for Botanical Documentation might even have one they'd let you look at, or know where to get one. Or they might be willing to take a look at your plants and just tell you. Berry Finder: A Guide to Native Plants with Fleshy Fruits for Eastern North America by Dorcas S. Miller, illustrated by Cherie Hunter Day. Identifies plants with fleshy fruits, including natives and some cultivated species that have become established in the wild. Includes many native shrubs and vines. (Many of these plants have fruits that are known or suspected to be poisonous. This is not a guide to edible plants.) Covers U.S. and Canada east of the Rockies, except southern Florida. Most useful in late summer and fall when ripe berries are present. Those are black raspberries. About three years ago I purchased some tiny canes and planted them in a massive container on my deck. I am now enjoying my second annual harvest. The fruit (which I have been plucking nearly daily) is identical to that in your photo. A friend of mine is a horticulturist, and he told me you can discern between black raspberries and blackberries by the difference you noted: Black raspberries are formed around cores that remain on the plant when the berries are plucked; blackberries are solid. Maybe you're better off, now that your "blackberries" have turned out to be black raspberries. I think it's cute that you have a Charlie Brown cup as this story's icon.